There were five contestants in the Podder Skinning Competition. Each of them submitted something very cool and interesting, but the three judges had to pick one winner out of them. After much deliberation and conversation, we decided that the winning skin is BOConnor by Brendan O’Connor. Congratulations, Brendan! Brendan is 25 years old and currently the lead software developer for a Healthcare company in Ireland called Technical Ideas. He studied Computing and Software development at college for 4 years and has been with the company since it began in 2004. 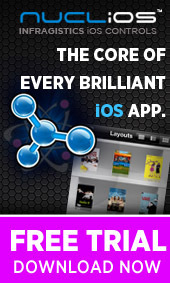 The main product they develop is called Socrates. It is a software product used by GP’s, Nurses and many other Healthcare professionals which manages an Electronic Health Record for patients within their practice and also the day to day running of the practice. 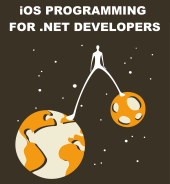 Currently they develop in C# .NET WinForms with SQL Server 2005. Brendan had never used WPF until he decided to enter the Podder Skinning competition. He has been following it for many months, briefly reading articles from the WPF posse posted at CodeProject. He also had some books on WPF lying around for some months untouched and once the competition was extended, saying he would enter just to give him an excuse to try out WPF and see what it was like. The competition had three judges, including myself. The other two were Marlon Grech and Jeremiah Morrill. I appreciate their help and thoughtful feedback. I’d like to thank everyone who took the time to submit a skin, and those who helped judge the skins! The Podder Skinning Competition is a success! The Podder Skinning Competition deadline has been extended to 00:00 (i.e. 12:00 AM) GMT on Monday, August 4, 2008. Only one person submitted an entry by the initial deadline (several others were submitted several hours too late). Most of the contestants said they just need more time to work on their skins. Since the whole purpose of this contest is to have fun and be creative, I see no reason why we shouldn’t have an extra month to work out the details! Anyone who has already submitted a skin, don’t worry. I deleted your submission comments so that people can’t steal your awesome ideas! Feel free to keep working on your skin and submit it again when you’re ready. 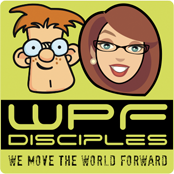 I am excited to announce that I am hosting a new WPF competition!! This contest allows you to create and submit your own skin for Podder, the WPF podcast player application. Since Podder was built to support “structural skinning” it can use any UI that you dream up to display its data and behavior. This contest will allow participants to focus on using WPF to create an awesome user experience, without needing to worry about writing the underlying application functionality. The Podder Skinning Competition, along with all the rules, prizes, and dates, is fully explained on this page of my blog. I also put together a step-by-step walkthrough of getting started with creating your own Podder skin, which you can check out here. I look forward to seeing the creative Podder skins that people submit. 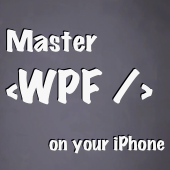 This is a very exciting time to be a WPF developer or designer! I published an article to CodeProject which discusses the solution to a tricky problem. It discusses the way that I implemented a piece of functionality in Podder that can be displayed in either the main window or a separate dialog window. This took me a while to get right, so I thought it might be beneficial to explain how it works. Podder v2 has been released! After a lot of work, fun, and learning, I’m thrilled to announce that the next version of Podder has been released!! 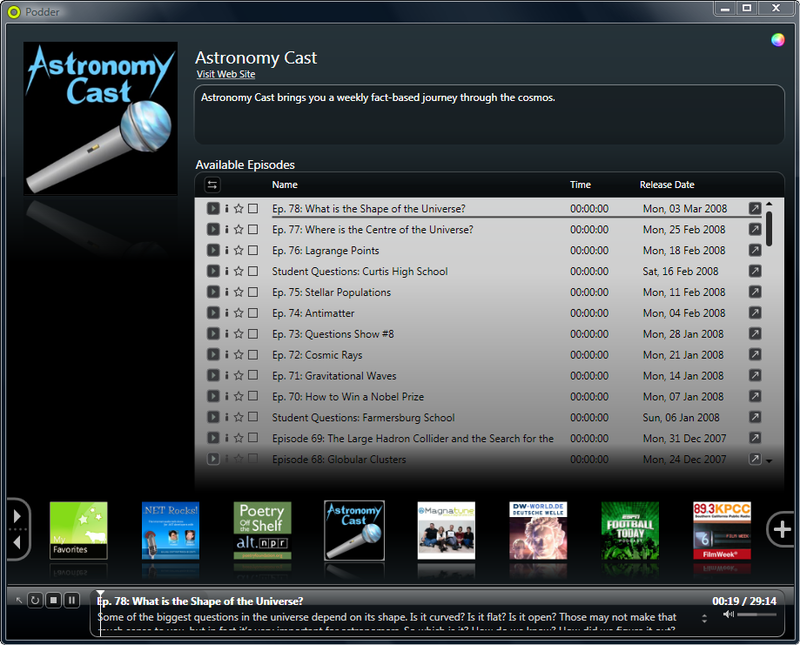 Podder is my WPF podcast player. I recently published a large article about the new version of Podder, how structural skinning works, the new binaries, new source code, a Silverlight screencast, and even an interview between Craig Shoemaker (host of Pixel8 and Polymorhpic Podcast) and Grant Hinkson (the Visual Designer who made Podder’s new skin). View the article and download the source code here. Grant really did an incredible job on the new skin. It was an amazing experience to work so closely with an accomplished Visual Designer.